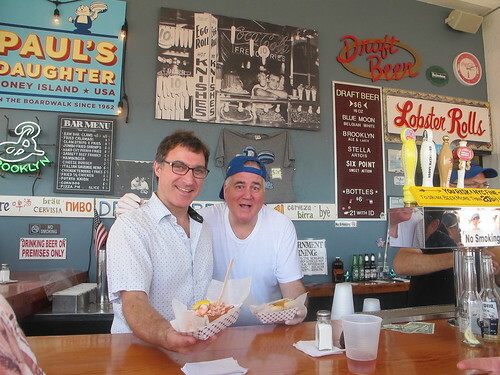 Tina’s father Paul Georgoulakos aka “The Chief” co-founded the restaurant formerly known as Gregory & Paul’s in 1962 and still supervises its clam bar. The renovated building, which was originally one of hot dog inventor Charles Feltman‘s restaurants, remains a masterpiece of vernacular signage. Among our favorites signs are the counterman’s cry “Hey! Get It Get It!” and the dapper Mr. Shrimp. 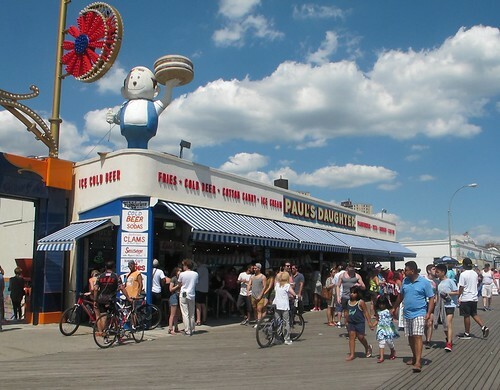 While Papa Burger, an A & W Root Beer figure from the 1960s, still anchors the Luna Park side of the building’s rooftop, Mama Burger remains flat on her back since Superstorm Sandy. The eight-foot-tall fiberglass figure got knocked over — at first she was thought to be missing— and her hamburger and Brooklyn Brewery mug blew away. The Brewery has come up with a T-shirt to pay tribute to Mama Burger and raise funds toward her restoration. “They have a real love for Mama Burger,” says Tina, who recalls how one day her father took a Brooklyn Brewery sign and stuck it on the figure’s beer mug. 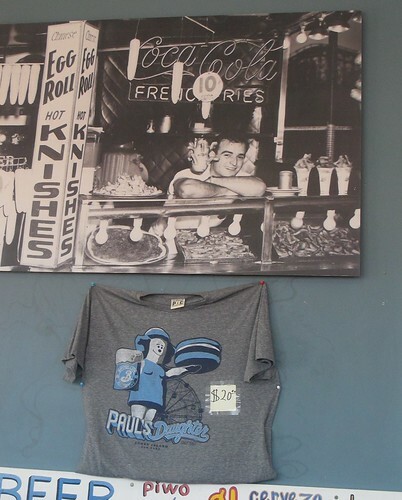 “I have to find people who can restore her.” Back in 2011, when Paul’s Daughter lost their lease –the store has since signed an 8-year deal to stay put–ATZ wrote about Mama and Papa Burger, which have been part of Coney’s skyline since the 1970s and are considered rare examples of roadside Americana. October 31, 2012: Missing in Storm: Have You Seen Coney’s Mama Burger? 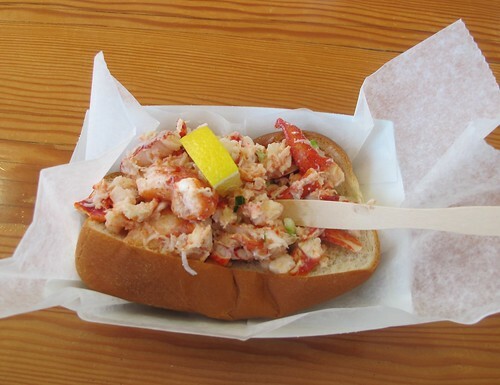 Is the Lobster Roll now going to be the Maine attraction at Paul’s Daughter?